Nick Srnicek over at Speculative Heresy asks some interesting questions about the relationship between marxism, non-philosophy, speculative realism and actor-network theory. What if capitalism-qua-system is as much a product of Marxist theories as it is of any physical and social reality? (…) How to resist something that is non-systemic, non-totalizing and more heterogeneous than previously presumed? (…) How to square the circle and incorporate Marxism, non-philosophy and ANT together? Explicitly or implicitly, his questions touch on a number of controversies, such as the micro-macro quandry in social theory, the “explain or describe” dilemma, the nature of critique and the relationship between social theory/philosophy and political action. Does ANT’s commitment to empirical description though have to necessarily lead to local studies incapable of grasping the big picture? The proponents of ANT often argue against making a priori distinctions between the local and the global or the micro and the macro, focusing instead on describing the equipment that produces distinctions like these. In theory at least it is possible to imagine that various descriptions of apparatuses operating in a variety of domains (from financial markets to healthcare to entertainment) can be connected to construct a more complete picture of how the prevalent socio-economic-technical etc. modes of ordering sustain themselves. How about combining ANT and Marx into an analytical apparatus called ANT-MARKS, dedicated to studying the burrows that ant-like actors leave behind during their ongoing construction of the global capitalist system? It’s hard to disagree with Oli Mould that 2001: A Space Odyssey is one of the greatest movies ever made about tools. Or should we say tool-being? Check out Paul Ennis’s interview with Graham Harman on the anotherheideggerblog about, among other things, a metaphysics video game, writing and publishing advice, and, oh yes, Heidegger! No diatribe against his former tribe, but still, Harman at his heretic best. Here’s a thought… What happens when Heidegger the tool breaks down? Or the reverse, when Heidegger the tool withdraws into the tapestry of philosophy? What is Harman doing when he is breaking Heidegger? “The Large, the Small and the Human Mind:” a highly interdisciplinary two-day conference at the New Gallery Lucerne, as part of the Swiss Biennial on Science, Technics + Aesthetics, bringing together scientists, sociologists, philosophers, ecologists, writers, artists, and policy-makers to discuss various theories of everything, among others with Bruno Latour as keynote speaker, Isabelle Stengers as chairperson, and Peter Weibel as panel discussion leader, on 16-17 January 2010. (Hat tip to Jess). Last week we were speculating here about the possible role of prescription painkillers in the performance of the Michael Jackson assemblage. This week The Huffington Post brings us Ryan Grim’s article about the role of LSD (yes, the psychodelic drug) in scientific progress and in particular IT innovation. Thus we learn that LSD has or may have inspired such innovators and innovations as Steve Jobs and Apple computers, Douglas Engelbart and the computer mouse, Larry Page and Sergey Brin of Google, Mark Pesce, coinventor of VRML, researchers at Sun Microsystems and Cisco Systems, Nobel Prize-winning chemist Kary Mullis, and, believe it or not, even Bill Gates is suspected. According to Grim, “Francis Crick, who discovered DNA along with James Watson, told friends that he first saw the double-helix structure while tripping on LSD.” If all this is true, then LSD-inventor Albert Hofmann (together with his invention) has had a profund effect on the recent history of the world. Hmm…, has there been any STS research into scientists’ drug-taking habits and their extended network of drug dealers? An ANTHEM contingent was deployed to Oxford yesterday, to take part in a discussion of matters big and small at the “From Scale to Scalography” workshop at Saïd Business School. (We even managed to tempt Graham Harman to come along.) Organised by the Institute for Science, Innovation and Society (formerly known as the James Martin Institute for Science and Civilization), the workshop focussed on the contentious issue of scale in social theory, often formulated as the micro-macro problem. The Word document with the programme contains the links to all the PDFs of the papers that have been presented and discussed. Woolgar et al.’s provocation piece (PDF) does a great job of spelling out the issues and controversies, situating them within the intellectual tradition of science and technology studies, and also posing a series of questions for discussion. 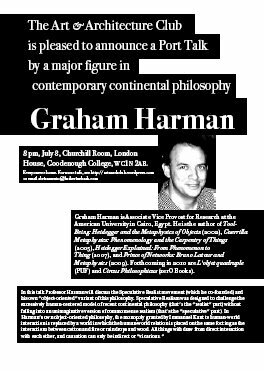 Click here for the details of Graham Harman’s forthcoming talk on speculative realism at the Goodenough Art & Architecture Club, Goodenough College, London, at 8pm on 8 July 2009. You are currently browsing the ANTHEM blog archives for July, 2009.